I finally went to sleep sometime after four o'clock this morning. Meanwhile my poor brain somewhat addled by the collywobbles that have jumped on me, reflected on earlier life experiences and this tidbit passed through my consciousness. Awake enough now to think about the memory, I thought to share an item from my teen years. In 1947 Colorado Springs got its second radio station when KRDO went on air in competition with KVOR. As a Western Union messenger I had access to both of these facilities as required by my employer and on behalf of the business operations of the radio stations. KVOR studios were on the top floor of the Exchange National Bank Building on the southwest corner of Tejon and Pikes Peak, one-half block east of the WU office. 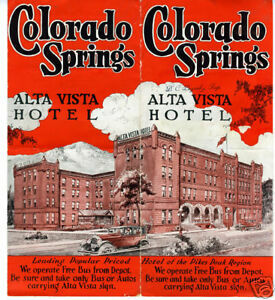 KRDO established its studios in the Alta Vista Hotel on Cascade Avenue, a bit more than a block and one-half from the office and to the west and north. The powers that be at the new radio station thought it an interesting idea to offer live broadcasts of certain major league baseball games. No, they did not hire reporters to go to remote locations, hooking up by telephone or whatever magical method that would be required to transmit the voice cross-country. Here's how it worked. Some city slicker in the venue where the game was being played would transmit a telegram to KRDO. Jerry, the teletype operator, would tape the message to a telegram blank as it came in, hand it to Dave, the dispatcher, who in turn handed it to me. I mounted the bicycle, pedaled to the Alta Vista, ran up the stairs and breathlessly handed the game report to the clerk on duty. INN 5, 0-0 SMITH PITCH; BARNES KO, NEEDLER 1, WOLF 9-4-3. Upon finishing his account of the fourth inning, and of course the commercial break, the reporter would take this message, we would hear crowd noises in the background, and "It's the fifth inning, still tied at naught. Smith takes the mound and Barnes comes up to bat for the Dodgers. Smith is in the windup; ball one! (Of course we hear appropriate game noises.) Here's the pitch - - called strike on the inside corner! Barnes spits on his hands, takes a new grip on the bat. He takes a ball, low and inside." (A certain amount of chatter about Barnes batting record) "And Smith delivers! Strike two called. Now Barnes shakes off the catcher's sign. -- Shakes it off again. There it is now, Smith is ready to deliver. Barnes swings and misses! One out, and Needler is coming to bat"
We hear the crack of the bat as the man goes on with his detailed account of Wolf hitting the second pitch between the second baseman and the right fielder (all have names, of course) fields the ball, throws to second, out, relayed to first, doubled them! Commercial break and the sixth inning message is already in the hands of the reader. And each inning is so relayed from the WU office on Pikes Peak Avenue to the studio on Cascade Avenue and the reporter makes up his detailed account of a game he never sees and, I suppose, the listeners imagined that they had been taken to the ballgame! They were taken, no doubt. I read somewhere else, years ago, another similar account. So I suppose that before the networks reached everywhere, many stations did similar things to bring listeners the games! Jim, the entertainment industry has always been right there with the latest technology to keep us amused! This is something related to your Western Union job that I had not heard. I was unaware that people have been duped by the media for so long. I thought media reported honestly "back in the day." So, truthfully, did that young teenager get a kick out of being a key player in this plot? Since the time of the Roman legions, and no doubt before that, people have been drawn drawn to bread and the circus [ball game]. Vee, "kick?" Well, I pedaled the bicycle! Honest reporting? Think Orson Welles, 1938. It's all entertainment. Chuck, certainly bread and circuses. The working man provides the bread, the politician provides the circus.